Shown on this page is the "Deccette" from 1953. Like many other radios featuring this cabinet shape, this set is often referred to as a "toaster". 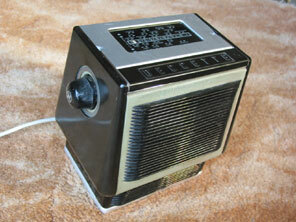 Other radios that have gained that shorthand description include the Ekco U159, Murphy A100 and K.B. FB10. 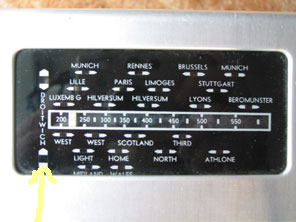 The Deccette is the radio that turns up least often nowadays. Unlike the others mentioned above, which worked only from mains power, the Deccette was primarily a battery receiver for which an optional matching mains power unit could also be purchased. The battery-only receiver operated from two all-dry batteries, the B101 supplying an H.T. of 67.5v and an AD35 supplying 1.5v L.T. The same battery set could operate on mains by use of the AC power unit that the receiver was designed to stand on. To operate the radio from the mains the receiver is carefully placed on top of the mains unit so that the connector plug in the power supply engages in the socket in the base of the receiver. (See picture below far right). Setting the radio onto its power supply automatically disconnects the internal batteries and converts the receiver to mains operation. The socket is not strong enough to support the weight of the power supply, so if the receiver is being moved using the built-in carrying handle the power supply would need to be supported from underneath too. The power supply unit incorporated its' own on-off switch, and a pilot light. H.T. current was supplied by a Westinghouse U429 half-wave metal rectifier, and L.T. current supplied by a Westinghouse 16K7 full-wave metal rectifier. Receiver valve line-up is X17, W17, ZD17, N19. The receiver was essentially designed for M.W. reception only, but by tuning past the lowest wavelength end of the scale to the Droitwich calibration mark (yellow arrow picture below left), a switch opens bringing a L.W. preset tuning position into operation. The receiver is notable for being one of the first sets to use a ferrite rod aerial, comprising of two coils wound on an iron dust rod. These were far easier to incorporate into a portable radio chassis than the frame aerials (usually wound internally round the cabinet) that had been used until then. The cabinet construction is quite complex, and servicing is made tricky due to the number of dismantling steps required to get at the chassis. Some of these steps require levering of the plastic panels, which obviously presents a risk as the cabinet parts become brittle with age. The cabinet is made of quite a selection of materials, including plastic, bakelite, metal, wood, rexine and Perspex. 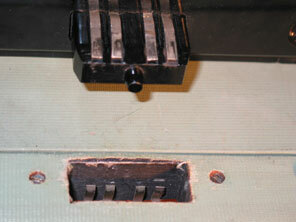 The "slats" protecting the speaker are particularly prone to bits chipping off. 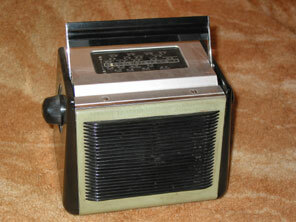 As the only radio able to operate from either mains or battery it was the most versatile of the "toaster" models marketed by various companies, but is definitely the least common. One of the chief reasons for this must be the original price. Costing £12.13.7 +pt it was very expensive in 1953, and the optional power unit cost an additional £5.5.0 +pt.